I therefore left Paris at 6am on Friday morning, because it had a couple of departmental high points planned for the day that were more or less conveniently located “on the way.” After a couple of hours in rush-hour traffic suburban Paris I eventually took A77 down to the Loiret department. The highpoint was supposed to be located in the vicinity of the city of Châtillon sur Loire. This information I had gathered from numerous websites and Google maps. But while everything seemed to be so clear when sitting in front of the computer and studying those maps, I now became fairly confused as to where exactly I had to go. Apparently the high point had to be somewhere to the south of Châtillon sur Loire and going down departmental highway D49. I eventually had to turn right and then go another couple of kilometers to …… Well, yes to where? The problem with these 300 meter highpoints is that they are not really very prominent landmarks but rather often just small bumps or even worse the highest point somewhere on a seemingly flat plateau. I just drove up and down highway D49 looking for some obvious sign pointing to some obvious highpoint. And on my second way up I noticed a sign saying “Les Etourneaux” (which was only visible when going north, and therefore I had missed it on my early drive by passed the intersection). Luckily I remembered now that on one of the sites I had seen a reference to the “Col des Etourneaux”, which was indeed the highest point in the department. Great, I thought, and took the small but still paved road west believing myself to be a bit closer to my destination. And sure enough after another couple of miles of driving on a gradually inclining road, I arrived at a point, where I could no longer go up. This sounds more exciting than it really was. It was not like I am arriving on top of Mount Everest, but a mere 273 above sea level. So what, you just have to take them when you get them. The “summit” area was characterized by a couple of signs pointing out that yes, indeed, now one has arrived at the summit. However, there was no reference to it being the high point of the department, but I guess here I just have to trust the internet (“once it is written on the internet, it must be true”. Le Magnoux is at once the name of the highpoint and the name of the nearby hamlet at whose outskirts the actual highpoint can be found (actually that hamlet is part of a larger community of “Preveranges”. At 501meter it is higher than the two highpoints I had visited so far on that day, but the approach is rather boring. One can drive right up to it, as the whole village is on a high plateau. The highpoint is marked by a nice big sign which states that this is the “point culminant du Cher and de la region Centre”. Nearby is a water tower. Looking around I had nice views to the south numerous villages on other high points or mountains, some of them definitely located higher up, but likely in another department and region. Behind the water tower about 80 meters from the main road was a half moon shaped viewing platform, which pointed out nearby as well as far away summits (Mount Ventoux, for once). Back at the first sign I realized that the elevation here was given as 504 meters. Hmm, a discrepancy of 3 meters with what I had researched online. What to do? Nothing at the moment, but I told myself that I would research that once I got back home in front of the computer. At the time of writing this, I am not any smarter than before having found contradicting information online. The weather was still terrific and I enjoyed myself immensely. I had not yet eaten, but wanted to hit one more high point before taking care of food. I chose the high point of “Puy de Montocel”, at 1287 meters higher than the combined elevation of the three summits I had reached up to this point. I got back in the car and after a quick visit of one of the villages to the south that I had made out from the summit I was on my way east before going south towards Clermont-Ferrand and then east again along highway A72. Once going east on A72 I noticed heavy grey rain clouds coming my way, and sure enough, about 10kms before I had to leave the interstate I got drenched (so to speak). It was a fairly big storm that also produced a lot of hail. I decided to drive past Palladuc, to sort of get behind the storm and then try to find a way up from there that would get me to the trailhead. Actually I had no idea whether there would be a trailhead, but I planned to drive up on paved roads (and dirt roads if necessary) as far as possible and then continue on food. I thus turned left at Chabreloche and headed north up a variety of narrow roads. It was still raining a lot, but once I had gone through the little hamlet of Les Cros (and the “Auberge du Montocel” and left the paved roads, the sun came out again and the weather almost instantly turned nice again. Shortly afterwards, when I parked my car, there were very few clouds left in the sky, but the trees were still glistening and dripping a lot and when I started walking I was glad that I had brought a rain jacket because I was getting dripped on every time I walked underneath a tree or touched a bush. I followed the forest roads in an uphill direction towards where I though the high point must be located. After a while at an intersection I followed the same strategy turning right and uphill. At some point the forest road went downhill again, and because according to the rough map I had brought I believed to be close to the high point I left the road and went cross-country further uphill. I have no idea whether I reached the summit as I never found any marker or other obvious sign but I did reach a plateau-like area in a clearing where numerous hints could be found that at least some other people had come to this point (and why would they otherwise?). There was an empty bottle put upside down on a stick, and there were a few more non-natural sticks that had been put here for some reason. A lot of trees had been cut down by a chainsaw and maybe there was a marker somewhere there but I did not find it. 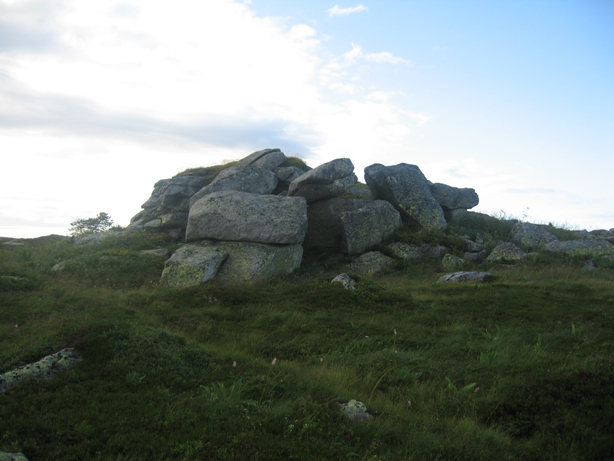 Nearby was moss-covered pile of rocks, and because it was a bit of a prominent point I declared it to the summit of the Puy du Montocel. I climbed it and took a few pictures and was then on my way again retracing my steps back to the car (which took a mere 15 minutes). The summit, had I then reached it, was a nice little exercise in routefinding, but because of the uncertainty whether I had indeed reached, I drove a way with a mixed feeling. Again, if I were ever to come to this area again, I promised myself to do a bit more research beforehand and climb the peak again some day. It was already almost 6pm when I drove away from the Puy du Montocel. What to do next. I quickly studies the possibilities and I picked as my next target “Pierre-sur-Haute”, the highpoint of the Loire department. This was not only the nearest one to where I was at, but it was also on my way, so to speak, or at least not too far out of the way. Plus, I could spend the night somewhere in the Ardeche or Lozere area and maybe do a couple of more summits the next day. Therefore, I floored the gas pedal and after a quick stop at the grocery store and the gas station, because I was getting a bit hungry after four summits and had been doing already many of hundreds or kilometers today, I drove the 50 minutes hours to the town of Chalmacel. This was the closest town to the summit and from there I set the GPS to the city of Puy where I planned to spend the night and along the way I would drive on the D6 over the “Col du Béal” from where the highpoint was only a mere 2.5 kilometers away. Apparently, at least that was how I interpreted the map, I would be able to drive pretty much all the way to the summit (where some sort of military installation or antennas occupied a large area). However, when at about 7.30 I arrived at the pass, I immediately saw a big Do Not Enter sign, but there was no barrier. I briefly contemplated whether I should risk driving the car up in spite of the sign, but then remembered that it was my in-law’s car and that I am a little bit overcareful when it comes to the military and therefore decided against it. But then I remembered my bike, stashed way deep down in the trunk under a bunch of other luggage. I quickly got it out and assembled it. It was getting quite cold and windy. Dark clouds flew by at a rapid pace and the sun which would not set for another 90 minutes or so still illuminated the landscape quite nicely. But it was cold nevertheless and I quickly put on a extra layer of clothing before swinging on my bike. I rode pass the “do not enter” sign assuming that bicycles would be exempt from that command. The pass was at 1400m and I therefore had to gain some 300+ meters to the summit. No problem you may think, but the headwind was very strong and cold and I therefore inched my way up the paved road only slowly. Coming back down would be more fun. Still it only took me 20 minutes to make my way up to a closed gate from where I could see the fairly extensive military installations on the summit. No way I was getting in there. I briefly considered climbing the fence, but I saw one car parked out front, which meant that the station must be manned. I rode back down the road for a few meters before dragging my bike off to the side and laying it into the grass. There was an outcropping of rock with an iron cross 100 meters or so to the west of the road and I hiked up there. Walking through the tall grass I got my feet soaking wet but did not care. The thrill of having reached my fifth French departmental highpoint in one day covered for that little inconvenience. I stayed on this make-do summit for 10 minutes contemplating the solitude and the nice scenery surrounding me (which was visible more or less in spite of the pretty dense and low hanging clouds). All the time I was also wondering whether there may be someone watching me from the military buildings. Upons this note of paranoia, I walked back to the bike and rode back the paved road to my car. I still had a couple of hours of driving to do. I put my bike back in the trunk and wanted to take off, when I decided to give the nearby “gite” a chance. There were a couple of cars parked up front and I could see through the window that a couple of people were having dinner. It was getting dark already and I had to drive during the dark anyway and so I decided to also have dinner at the place (support the local economy, because business was obviously slow that night). A pretty young couple was running the place and they were very friendly. The guy explained the menu to me and I chose the “cheese and sausage platter”. I forgot the exact expression but I was served a variety of cheeses and “jambons” alongside with “cornichons” and bread. It was delicious, the only thing missing was a beer. But I opted for limed flavored soda water instead. Actually I had three of those, also very good. The couple was very interested in talking to the tourist and particularly the guy wanted to practice his English. I complied to that request telling him about what I was doing, what I had done and where I was headed. I also mentioned that I had yet to find a place and five minutes later he came back with a print out of all the hotels in Puy, including phone numbers, and he also let me use their land line phone. I was overwhelmed. Too friendly. I had briefly considering staying at the gite (they had about 10 beds available), but I did not want to have to do the two hours early in the morning and there called a couple of places before reserving a room at the second or third place I called. Apparently, there was some festivity going on in Puy and in retrospect it was probably good that I called and reserved in advance instead of just showing up at various hotels, because there were only a few rooms left. Great, great, great, I love it when things work out perfectly. After paying I got in the car, put back in my book on tape and drove the remaining 100km (but two hours because of switch-backs, etc.) to Puy-en-Velay, where I arrived at around 11 or so and immediately check into the hotel and went to bed.